With neat sketch,describe operations of tunnel diode,State its applications. OR Sketch the construction of Tunnel diode and write its operation. Question: With neat sketch,describe operations of tunnel diode,State its applications. OR Sketch the construction of Tunnel diode and write its operation. 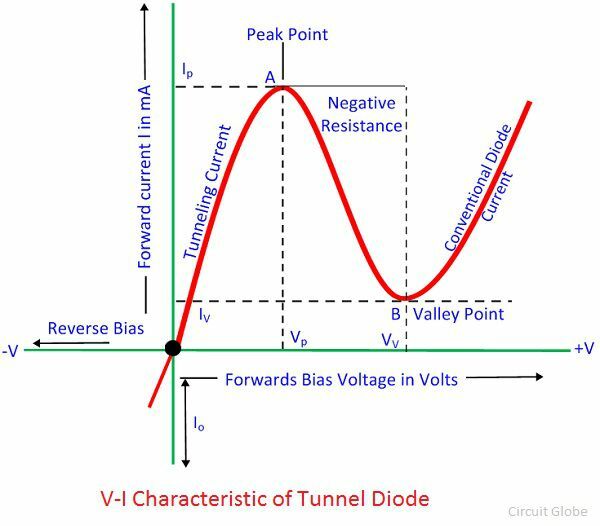 Tunnel diode is a thin junction diode which under low forward bias conditions exhibits negative resistance useful for oscillation or amplification. The junction capacitance of the tunnel diode is highly dependent on the bias voltage and temperature. 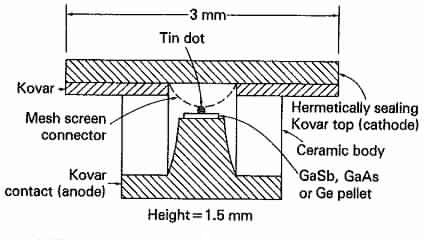 A very small tin dot about 50μm in diameter is soldered or alloyed to a heavily doped pellet of n- type Ge, GaSb or GaAs. The pellet is then soldered to a kovar pedestal, used for heat dissipation, which forms the anode contact. The cathode contact is also kovar being connected to the tin dot via a mesh screen used to reduce inductance. The diode has a ceramic body and hermetically sealing lid on top. In tunnel diode semiconductor material are very heavily doped, as much as 1000 times more than in ordinary diodes. This heavy doping result in a junction which has a depletion layer that is so thin (0.01μm) as to prevent tunneling to occur. In addition, the thinness of the junction allows microwave operation of the diode because it considerably shortens the time taken by the carriers to cross the junction. A current-voltage characteristics for a typical Germanium tunnel diode is shown in figure. Forward current rises sharply as voltage is applied. At point A, peak voltage occurs. As forward bias is increased past this point, the forward current drops and continues to drop until point B is reached, this is the valley voltage. At point B current starts to increase once again and does so very rapidly as bias is increases further. Diode exhibits dynamic negative resistance between A and B therefore, useful for oscillator applications. 1)Tunnel diode maybe used as a mixers. 3)They are used s oscillators upto 100 Ghz.